You want to create a professional website without graphical skills or technological/HTML knowledge and yet still have all the added extra's such as BLOG, Calendar, e-Commerce, Google services, Guestbook, impressive image slideshows, PodCast, Counters, and more...? 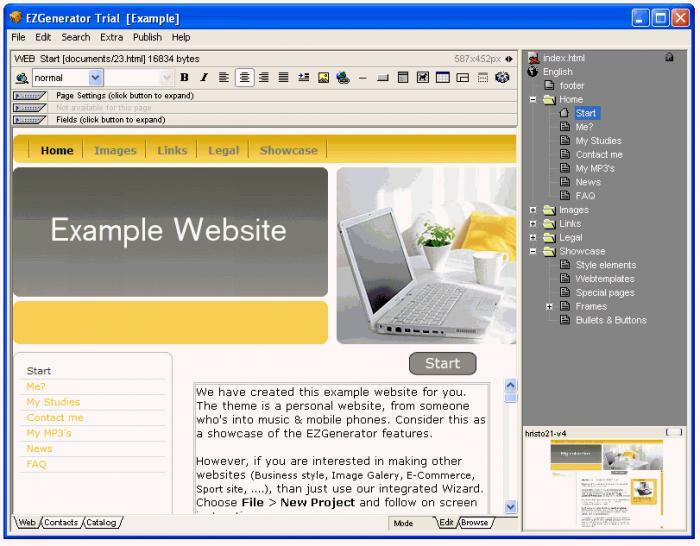 EZGenerator Website Builder is an easy and affordable solution that enables anyone to create professional looking website in no time at all and creatively edit your digital images. create a high quality and professional looking website in no time at all. ...... requires no technical IT skills, works without special scripts and is not limited to proprietary hosting services (in other words, the resulting website can be hosted anywhere). * Anyone can make their own professional looking website. No HTML or other technical knowledge is required. All you need to know is how to copy/paste/write text and insert images. * It's cost-effective. Only a one-off cost 99 Euro (129 USD) investment with no extra monthly fees. You can host/upload your website to any hosting company. And you can make multiple websites with EZGenerator Website Builder. * It's easy to create your website, but also - and perhaps even more important - easy to maintain your website. There's nothing worse than an outdated website. Create a catalog of your products, with prices, descriptions, photographs etc. Qweas is providing links to EZGenerator Website builder 4.0.0.391 as a courtesy, and makes no representations regarding EZGenerator Website builder or any other applications or any information related thereto. Any questions, complaints or claims regarding this application EZGenerator Website builder 4.0.0.391 must be directed to the appropriate software vendor. You may click the publisher link of EZGenerator Website builder on the top of this page to get more details about the vendor.